Saying a relaxed cheers when toasting friends in the park is now possible thanks to KoRKi® by brandident, because the bottle top made out of silicon puts an end to wasps in the lemonade or spilt beer on the picnic blanket. What’s more the flexible, robust lid allows drinks to stay fresh for longer and it means you don’t get your own beer mixed up with that of your neighbour. Finally, the practical product arouses the passion for collecting and makes a topic of conversation at open-air events. 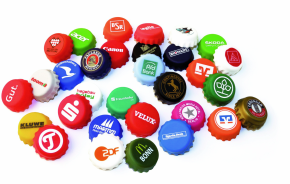 KoRKi® is food-safe, dishwasher-safe and can be used as often as one likes – an ideal promotional product for the beverage industry for instance. The product that won a Promotional Gift Award 2017 in the category Give-aways can be dyed in Pantone colour guide shades, which include colours with effects, i.e. such as gold. The items are also imprinted using Pantone colours or with a digital print including colour gradients. Manifold packaging options round off the offer.